”Close to 594 million which is 48 per cent of population in India practices open defecation. If this poo continues to be let loose on us, there will be no escaping the stench of life threatening infections, diseases and epidemics. Think about it. Half the population doesn’t use a toilet while the other half of the population accepts it. We simply accept India as it is. We are part of the issue, part of the acceptance. It’s World Toilet Day. This is the day to realize how good some of us have it – we take a pooh in a porcelain bowl and with a push of a button we never have to smell it again. More importantly, it is a day to acknowledge that a large portion of the world does not have this luxury and in fact many people die every year due to faecal contamination. Of the seven billion global humans, 4.1 billion are discharging sewage into the environment without treatment, resulting in environmental degradation and adverse human health effects (Baum et al., 2013). The goal of sanitation is to reduce the burden of disease and illness-related expenditure, improve water quality, and ultimately result in a higher quality of life (SACOSAN, 2008). Adequate sanitation is defined by the United Nations (2008) as having access to sanitation facilities that isolates the excreta from human contact (includes pit latrine, latrine with slab; and composting toilet). Unimproved sanitation facilities are flush toilets that are not connected to a sewer, latrine without slab (open pit), bucket, hanging toilet and having no access to facilities (UN 2008). The delivery of safe and effective sanitation services includes infrastructure (e.g. latrines, sewers), associated behaviors (e.g. toilet usage, hand-washing) and an enabling environment (e.g. public health regulations, fiscal incentive schemes for achieving sanitation outcomes) (SACOSAN, 2008). Currently, 2.6 billion people live without adequate sanitation based on the above definition (Baum et al., 2013). But of the 4.3 billion people using toilets connected to a sewer, 1.5 billion people still have their waste not treated (Baum et al., 2013). Globally, it is estimated that 64% of people are dumping raw sewage into the environment without treatment (see figure) (Baum et al., 2013). 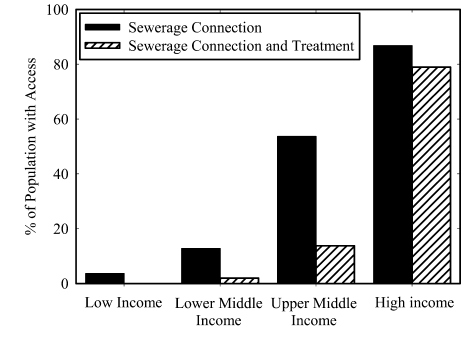 The difference between sewage connections without end treatment and connections with sewage treatment in 2010, by country income group (Baum et al., 2013). Contaminated water from inadequate waste management (human excreta, organic and inorganic solid and liquid) results in the spread of diseases and environmental degradation (Baum et al., 2013, Gandhi, 1998, Government of India, 2006, SACOSAN, 2008). The meagre sanitation conditions occurring in developing countries have been directly correlated as one of the leading causes of infant mortality, as well as impacting early cognitive and motor development and undermining educational achievement (SACOSAN, 2008). Poor sanitation has been recognized as both a global issue and a global responsibility, and was included in the Millennium Development Goals (Mutagamba, 2003). The 2015 Millennium Development Goal for access to safe drinking water is currently on target, but the sanitation target will be missed by 1.9 billion people (Baum et al., 2013). The global sanitation situation has been labeled “the silent crisis” since more resources are directed to other, more attractive sectors than sanitation, such as water, health and education (Drangert et al., 2012). Sanitation should be a basic human right, but instead it is used as a means to divide social classes (Mutagamba, 2003). For those with financial means, flush toilets are a luxury that is expected; however, at the other end of the spectrum, finding a safe place to squat is a daily conundrum. Access to adequate sanitation is not only about health but necessary for maintaining personal dignity (UNICEF, 2008). Over the centuries, the resources and technology available to manage human waste products have changed and so have the objectives, e.g. from avoiding stepping in faeces, to controlling smell, to complying with municipal effluent laws (Drangert et al., 2012). The principle of isolating faeces to avoid human contact and to avoid the contamination of drinking water has remained the same over the centuries but, with increased population density, more sophisticated methods of isolation and treatment have been required (Drangert et al., 2012). As hygiene habits and local cultural practices differ globally, designing and providing sanitation systems is not a simple fix. Cultural issues around hygiene practices include the feeling of intrusion on a private/personal issue and superstitions, such as believing that toilet use may lead to fertility problems (Mutagamba, 2003). Flush toilet are still seen as the gold standard around the world (Drangert, 2003), signifying class and wealth so that even in water-stressed areas, such as South Africa (Republic of South Africa, 2011), people want flush toilets. Such inclinations need to be taken into account when trying to improve access to adequate sanitation. BAUM, R., LUH, J. & BARTRAM, J. 2013. Sanitation: A Global Estimate of Sewerage Connections without Treatment and the Resulting Impact on MDG Progress. Environmental Science & Technology, 47, 1994-2000. DRANGERT, J.-O. Year. Requirements on sanitation systems – the flush toilet sets the standard for ecosan options. In: International Symposium on Ecological Sanitation, 2nd, 2003 Lübeck, Germany. DRANGERT, J.-O., SCHÖNNING, C. & VINNERÅS, B. 2012. Sustainable Sanitation for the 21st Century [Online]. 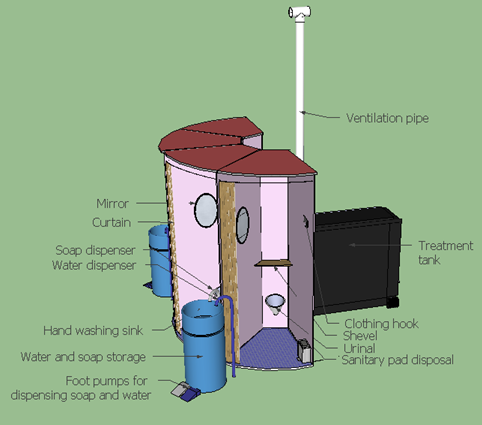 Available: http://www.sustainablesanitation.info/m3.php [Accessed January 10 2013]. GANDHI, R. 1998. Water and Sanitation – A Baseline Survey. Indian Institute of mass communication New Delhi: Rajiv Gandhi National Drinking Water Mission. GOVERNMENT OF INDIA. Year. A movement towards total sanitation in India. In: South Asian Conference on Sanitation, 20-21 September 2006 2006 Islamabad, Pakistan. Government of India. GRIFO, F. & ROSENTHAL, J. 1997. Biodiversity and Human Health, Washignton, D.C., Island press. JÖNSSON, H., STINTZING, A. R., VINNERAS, B. & SALOMON, E. 2004. Guidelines on the Use of Urine and Faeces in Crop Production. EcoSanRes Publication Series. Stockholm: Stockholm Environment Institute. KING, F. H. 1911. Farmers of Forty Centuries; Or, Permanent Agriculture in China, Korea, and Japan, Project Gutenberg eBook. MUTAGAMBA, M. Year. Ecosan – what kind of advocacy is needed. In: International Symposium on Ecological Sanitation, 2nd, 2003 Lübeck, Germany. REPUBLIC OF SOUTH AFRICA. 2011. World Cup Legacy Report: Water [Online]. Republic of South Africa. Available: http://www.environment.gov.za/sites/default/files/docs/water.pdf [Accessed February 12, 2013]. SACOSAN 2008. Sustaining the Sanitation Revolution – India Country Paper. In: DEPARTMENT OF DRINKING WATER SUPPLY & MINISTRY OF RURAL DEVELOPMENT (eds.) SACOSAN III. New Delhi: Rajiv Gandhi National Drinking Water Mission. TIDAKER, P., MATTSSON, B. & JONSSON, H. 2005. Environmental impact of wheat production using human urine and mineral fertilisers – a scenario study. Journal of Cleaner Production, 15, 52-62. UNICEF. 2008. India: Water, Environment and Sanitation [Online]. United Nations. Available: http://www.unicef.org/india/wes_209.htm [Accessed January 23, 2013]. UNICEF. Available: http://www.who.int/water_sanitation_health/monitoring/jmp2008.pdf [Accessed February 12, 2013]. WINBLAD, U., HEBERT, M., CALVERT, P. & MORGAN, P. 2004. Ecological sanitation, Stockholm environment institute.